A grid is a network of horizontal and vertical lines used to identify locations on a map. In ArcGIS Pro, there are two categories of grids, graticules and measured grids, that are used to display locations. A graticule displays coordinates in latitude and longitude. A measured grid displays coordinates from a projected coordinate system. 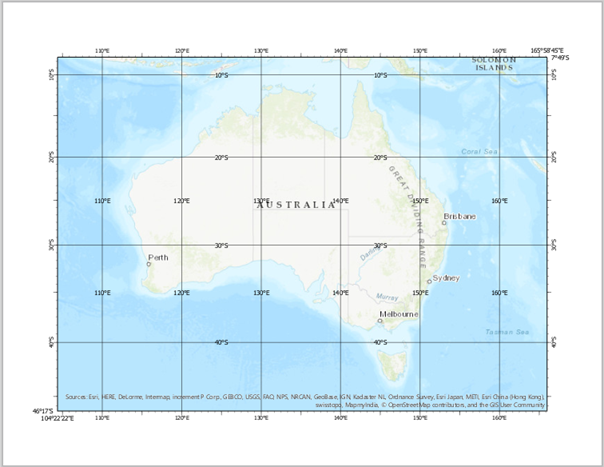 In this tutorial, you will add a graticule to a map frame and then modify its components. On the Insert tab, in the Project group, click New Map . The images in this workflow use a map with the topographic basemap. However, any basemap can be used. To add a basemap to your map, click Basemap from the Layer group in the Map tab and select a basemap from the gallery. On the Insert tab, in the Project group, click New Layout . In the ANSI Landscape section, click Letter 8.5" x 11". Under Orientation, click Both . Under Placement, select Offset from edge. Change the Margin to 0.5 in. On the Insert tab, in the Map Frames group, click the Map Frame drop-down menu and select Default Extent for the map you just added. On the layout view, snapping to the guides as your outline, click and drag to create the map frame. Right-click the map frame on the layout and click Activate . Navigate to Australia and change the scale of the map to 1:30,000,000. When you are satisfied with how Australia fits within the map frame, under the Activated Map Frame tab, on the Layout tab, in the Map group, click Close Activation . On the Insert tab, in the Map Frames group, click the Grid drop-down menu and click Black Horizontal Label Graticule. On the Contents pane, expand the Grids heading. Right-click Black Horizontal Label Graticule and click Properties. The Format Map Grid pane opens. This graticule includes gridlines, ticks, and labels. The graticule is not limited to what's included. You can add additional components to the graticule. You will start by adding corner labels to provide a clear point of reference for the map. In the Format Map Grid pane, on the Components tab , click the Add drop-down menu and choose Add Corner Labels. To better see the corner labels on the layout, press and hold the C key on your keyboard and zoom into the bottom left-hand corner of the layout. By default, corner labels are added to all corners. You will change this to show two labels. On the Format Map Grid pane, under Corner Visibility, click Selected. Then press and hold Ctrl and click 2 and 4 to select both corners. Uncheck North-South and East-West to turn off those corners. The remaining corner labels show labels in the lower-left hand corner and the upper-right hand corner. While holding the C key on your keyboard, zoom out to the full extent of the layout. 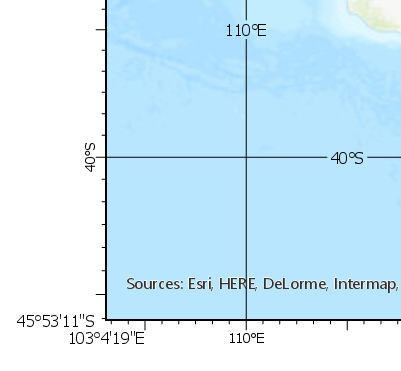 The corner labels may appear larger than the existing labels on the graticule. To change the size of the corner labels, under the Appearance heading, click the Symbol. On the Properties tab, expand the Appearance heading and change the Size to 8 pt. Click the back button to return to the Components tab . To make the map easier to read, you'll add interior labels to display the latitude and longitude of interior lines on the map. In the Format Map Grid pane, on the Components tab , click the Add drop-down menu and choose Add Interior Labels. Under the Positioning heading, click the 1/3 arrangement button . This adds labels to the grid lines one-third of the way from each map edge. The interior labels may appear larger than the existing graticule labels. To change the size of the interior labels, under the Appearance heading , click the Symbol. For some layouts it can be helpful to orient labels vertically. You will do this for the East and West labels. In the Format Map Grid pane, on the Components tab , in the Components list, click Labels. Using the C key on your keyboard, zoom in to the west side of the layout. In the Format Map Grid pane, under Vertical, click East and West. Notice how the labels have changed. When you insert a measured grid or graticule, the Automatically adjust option is checked. This is the default setting so when the map frame is activated and you zoom in and out, the interval changes to avoid cluttering the map. You'll uncheck it to further customize the components of the grid. On the Options tab , uncheck the Automatically adjust check box. On the Components tab , click Gridlines. While holding down the Ctrl key on your keyboard, click Labels and Interior Labels. Under Interval, change the Longitude to 10 degrees. By default, the Sync values option is checked. As changes are made to the Longitude interval, the Latitude interval is automatically changed to be the same. In this case, the intervals for both Latitude and Longitude are changed to 10 degrees. Uncheck this to set different intervals for each axis. All the modifications you have made can be saved to a style. The next time you want to add a graticule you can use this style item. In the Contents pane, right-click Gray Horizontal Label Graticule and click Save to style. Set the Style to Favorites, provide a Name, Category, and Tags, and click Save. The style item is now added to the grid gallery. To see it, on the Insert tab, in the Map Frames group, click Grid and the style item appears at the top of the gallery.